Its smell is its most noticeable attribute, but lemon verbena possesses a host of less obvious medicinal benefits that make it such a popular herb. Of all the lemon-scented herbs, lemon verbena has one of the strongest aromas. It gained popularity for this quality when introduced to Europe in the 18th century because it could be used as a flavoring substitute for the more scarcely available lemon. It has also been used commonly as a remedy for several different ailments, and its medicinal use continues today. Ameliorating minor illnesses. Lemon verbena can relieve congestion from the common cold and helps induce sweating to break fevers. Reducing joint and muscle pain. Pain because of inflammation or exercise can be diminished by using lemon verbena. Soothing abdominal discomfort. Several different intestinal ailments are improved with the use of lemon verbena. Calming anxiety. Lemon verbena is a mild sedative that can reduce feelings of anxiety and help induce sleep. Lemon verbena is able to reduce pain in the joints and muscles thanks to verbascoside, which reduces inflammation and improves joint flexibility. Studies have suggested that nonanal is the active component responsible for soothing abdominal distress. Additionally, the lemon verbena plant contains flavonoids, citral, limonene, and alpha-thujone, all of which are thought to play a role in the plant's medicinal properties, although their exact mechanisms of action are not yet fully understood. Turmeric and devil's claw are herbs with strong anti-inflammatory properties, whereas lemon balm and lavender also have sedative, relaxant properties. Lemon verbena is mostly safe for oral and topical consumption. The essential oil can cause skin redness or photosensitivity when applied externally and so should be diluted before use. It is also advisable to ingest lemon verbena preparations in moderation, as overconsumption of the herb may cause nausea. There are no known medical interactions with the lemon verbena herb. However, lemon verbena may worsen kidney disease, and it has been known to cause allergic reactions. Allergy symptoms include shortness of breath, chest pain, and hives or rashes. A doctor should still be consulted before beginning a regimen, particularly during pregnancy or breastfeeding. Lemon verbena is popular for both its culinary and medicinal uses. Lemon-flavored jellies, cakes, drinks, and puddings often use lemon verbena, and some health benefits may be obtained from these preparations, but they will be greatly reduced compared to those obtained from consuming the leaves in medicinal forms, intended for either internal or external use. Raw. Young uncooked lemon verbena leaves can be used in salads or sandwiches to add a lemony zest and obtain all of its four main health benefits. However, mature leaves may be too tough to be consumed raw. Dried. The dried leaves of lemon verbena can be added to sachets or used as a potpourri in order to release their soothing aroma. Infusion. Lemon verbena infusion provides all of the herb's many health benefits. Its sedative property makes it an excellent choice of beverage before bed, while its anti-inflammatory benefits are useful for colds or upset stomachs. It can also be helpful to drink before or after intense exercise to prevent muscle pain. Powder. Lemon verbena powder can be used to create tea or to flavor another beverage, and it provides all of the herb's health benefits. Essential oil. This preparation should be used only externally. It can be diluted and applied directly to the skin near painful joints or muscles for relief, or it can be added to lotions for a similar effect. When diffused using aromatherapy lamps, lemon verbena oil provides calming benefits. Tincture. A few drops of a lemon verbena tincture added to any beverage can help to calm an upset stomach or to bring on sleep. Capsules. Capsule forms contain fixed doses that can be easily consumed as a mild anxiety and digestive aid. Lemon verbena tea is widely available in grocery stores and local markets around the world, and the dried leaves used to make it can be found online and in herbalist stores. Fresh lemon verbena leaves are less common, but may be available in farmer's markets, particularly in warmer climates. 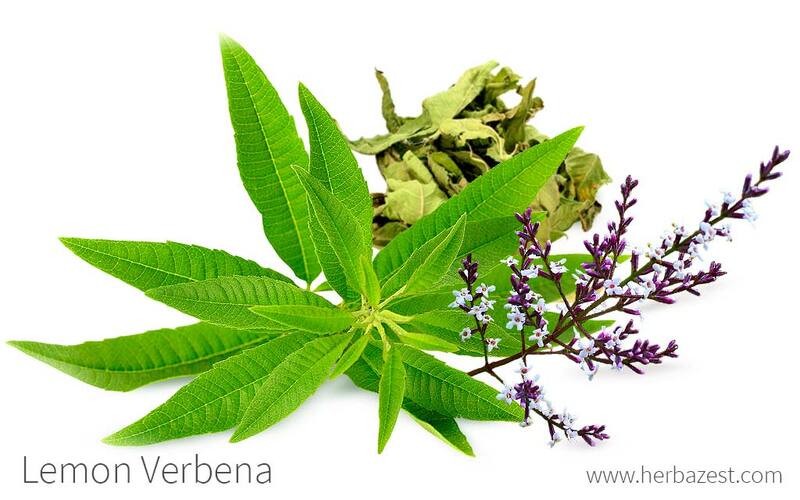 All supplemental preparations of lemon verbena are available online and in herbalist stores. Sachets may also be available from perfume and fragrance stores, while massage oil is likely to be found in stores focusing on soaps and lotions. Thanks to its pleasant lemon aroma and its ability to attract pollinators like butterflies, lemon verbena is a favorite herb to grow in backyards and gardens. It is a perennial plant, but it requires some extra care to thrive year after year. Lemon verbena cuttings should be sown in light, well-drained, alkaline soils. Seeds may be used as well, although they are less likely to flourish in colder environments. Cuttings or seeds should be placed three feet (1 m) apart for optimum growth. The plant requires full sun and frequent moisture. Lemon verbena leaves can be harvested any time after the plant reaches maturity. Few pests or diseases attack the plant, but it may be susceptible to mites and whiteflies. The lemon verbena plant cannot survive temperatures below 20°F (-7°C), and as such, it cannot survive winters in zone 8 or below. In cold environments, the plant can either be grown in a pot and brought indoors during the winter or treated as an annual. In winter, even in warmer climates, the plant will lose its leaves. It should be cut back significantly at this point to ensure new growth in the spring. Tendrils of the plant can be pruned to keep a manageable plant size. Some gardeners encourage cutting off new flower sprays to focus the plant's energy on its leaves. Further information about growing lemon verbena can be found in the herb garden section. Lemon verbena is a bushy, perennial deciduous shrub that can grow up to six feet (2 m) tall. It has strongly scented, lance-shaped leaves that grow in groups of three or four and can be from one to three inches (2 - 8 cm) long. Tubular flowers grow in small clusters and can range in color from white to a pale purple. Lemon verbena, Aloysia citriodora, is often called lemon beebrush or lemon vervain - vervain being a common variation of the Spanish verbena (along with the French verveine). The plant also has been reclassified several times over the course of history, and so it may be referred to in older sources as Lippia citriodora, A. triphylla, L. triphylla, Verbena triphylla, or Zappania citriodora. Lemon verbena is a member of the Verbenaceae family. This family is commonly called the verbena or vervain family, and it contains 35 different genera and at least 1,200 species. There are over 250 different species of plants that are called verbena, but unlike A. citriodora, the majority belong to the genus named for them - Verbena. A. citriodora is more commonly associated with Phyla dulcis, which is a plant used to relieve inflammation and treat coughs, and Lippia adoensis, an African herb used in tea. Though each of the three herbs has been classified into different genera under the contemporary classification system, they possess many similar properties. Lemon verbena enjoyed its height of popularity during the 18th and 19th centuries in Europe. In 1784, it was brought to Spain from its native South America. It was easier to grow and cheaper to procure than lemons, so it became a common citrus substitute. Several popular Spanish and French beverages used the herb to provide flavor. However, it eventually lost its popularity and was replaced by lemongrass, a plant that has a similar lemon flavor and scent but was even cheaper to produce than lemon verbena. Lemon verbena was named after Princess Louisa of Parma, wife of King Carlos IV of Spain, who was in power when the herb was brought to Europe. Its genus name, Aloysia, is a variation of Louisa, and in several languages, it is still colloquially called herb Louisa (or a corresponding translation). Although a popular herb, lemon verbena is not a crop of much economic significance. Because there is little yield of oil compared to the volume of leaves, it is not a widely-grown crop globally. It is cultivated in South America, often for use as a culinary ingredient or tea, and mainly for its oil in Mediterranean Europe, North Africa, and Asia. In the past, lemon verbena was associated with holiness and was commonly believed to have the ability to ward off evil. Teas made from several different species of verbena plants were thought to provide protection against the devil, vampires, and other demonic entities. Lemon verbena is not only used medicinally; its strong lemony fragrance, manufactured by distilling oil from the plant's leaves, is a widely used ingredient in perfumes and aromatherapy products, including candles and diffusible oils. Lemon verbena leaves can be used to garnish fish and poultry dishes, usually as a substitute for lemon, and they are also commonly used as a flavoring agent. The lemon verbena plant may also be useful in gardening, since its citrus scent attracts several different types of pollinators - notably, butterflies - that promote new growth. Lemon verbena is a fragrant addition to any herbal garden. Moreover, this versatile herb can be used in any of a number of different preparations, both medicinal and culinary, in order to reap its benefits.